Ghana art popularity stokes calls for national gallery - SABC News - Breaking news, special reports, world, business, sport coverage of all South African current events. Africa's news leader. 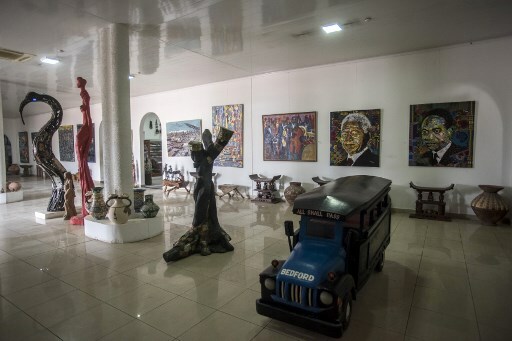 Paintings, statues and other pieces of art are displayed at one of the showrooms inside the Artist Alliance Gallery in Accra on December 11, 2018. - The Artist Alliance Gallery is one of the most known places in Ghana that sells artwork and handicrafts from all kinds of different Ghanaian artists. It's often visited by tourists and it's a reference inside the Ghanaian art scene. Veteran artist Ablade Glover measures spaces on a canvas with a palette knife, then dabs on vibrant blue paint while the morning light pours into his Accra studio. The 84-year-old artist, educator and founder of the Artists Alliance Gallery in Ghana’s capital has won national and international recognition for his work. He set up the gallery 25 years ago and moved it to its current location, a three-storey building on the beachfront 11 years ago. The premises are open to the public, offering local people and tourists the chance to see contemporary art, mostly from Ghana itself. When Glover started out, there was little support for local artists and most needed to hold down day jobs to make a living. But in recent years there has been a huge swing. More artists are making a living from their work as a result of galleries like Glover’s, festivals, collectors and art professionals. One of Glover’s works hangs in Seth Dei’s private gallery, on a quiet street in a leafy suburb of Accra. The 73-year-old businessman has been an avid supporter of Ghanaian artists for several decades. He has seen them struggle and slowly build up their reputations. He said he would much rather have a painting by a Ghanaian in his living room than a Picasso. “I like to be surrounded by paintings that I can understand, that reflect who I am,” he told AFP, looking at Glover’s rendering of a forest in vivid orange and red. The work is one of about 550 pieces of art spread between his home, gallery and in storage. Dei, who co-founded Ghanaian fruit export company Blue Skies, started collecting local art in 1993 and says, at that time, artists were not well-supported. “The artists in our society found themselves a bit ignored and lonely and in the society as a whole we didn’t have a lot of people buying art,” he reflected. He did what he could to help, buying art and encouraging the artists to keep producing. “It got to a point where artists would come and say, ‘I painted this and I think you should have it in your collection’,” he said. As a result, he saw the careers of Wiz Kudowor, Larry Otoo and Kofi Setordji build up to the point where they have international reputations. “People are getting used to the idea of pricing works in USD, which would have been impossible a few years ago, and art prices are rising,” said Dei. The increasing popularity of Ghanaian art is a double-edged sword, for a lot of it has left the country, as expatriates or companies buy works. Glover said he wants to see a public institution invest in keeping work in Ghana for Ghanaians to appreciate, hoping the government will step in and create a national art museum. While both he and Dei have their spaces to exhibit — and for Glover, to sell — they are keen for the government to take a similar interest. Both say creating a national art gallery would be a good place to start. Dei said he would be happy to see his collection form part of it, so everyone can enjoy the nation’s talents. Nana Oforiatta Ayim has been promoting Ghanaian artists through curating exhibitions, a mobile museum and working to develop artists since 2002. The writer, art historian and filmmaker has held exhibitions in Ghana and Britain. Oforiatta Ayim moved back to Ghana from Britain in 2011 and wanted to use her network of contacts to find ways for local artists to live and work and get global recognition. “I had seen the older artists do their work here but (they) didn’t have such successful international careers,” she said. This month Oforiatta Ayim and Ghanaian-British architect David Adjaye announced that Ghana would have a pavilion at this year’s Venice Biennale in May. Plans are also afoot for art to be exhibited in Ghana, said Oforiatta Ayim after the glitzy announcement in Accra, which was attended by British supermodel Naomi Campbell. “David and I have been working on the Venice Biennale as part of a wider initiative to create awareness and infrastructure within Ghana for art,” she said. This entry was posted on 21 Jan 2019,06:33AM at 6:33 AM and is filed under Lifestyle. You can follow any responses to this entry through the RSS 2.0 feed. Both comments and pings are currently closed.